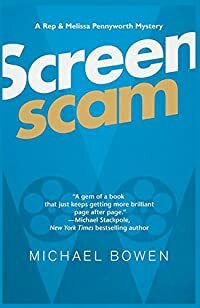 Screenscam by Michael Bowen, a Mysterious Review. Review: Michael Bowen introduces a new series character, Reppert "Rep" Pennyworth, an Indiana-based lawyer, in Screenscam, an entertaining if decidedly odd mystery. The synopsis implies the plot may be a bit convoluted, but it's much more than that. In addition to the intricate weaving of the corporate takeover of Tavistock and manipulation of the film industry's highest award, the FBI plays a role as does an organization that caters to individuals who enjoy a good spanking. It's easy to lose track of the various threads here, but in a way, it doesn't matter much … it's a fun book to read. Bowen does a good job of making Rep, his wife Melissa, his employer and his client, more than the one-dimensional caricatures they could easily have been. This suggests the start of an interesting series for Rep rather than a single mystery novel. Acknowledgment: Poisoned Pen Press provided an ARC of Screenscam for this review.